Through a cloudy sky, I got a few brief glimpses tonight of the Moon passing over the stars of the Pleiades (the Seven Sisters). This is a snapshot at 7:27 pm New York time, with Alcyone, the brightest of the cluster, only 27 minutes before the moon's dark limb caught up to it and covered it. 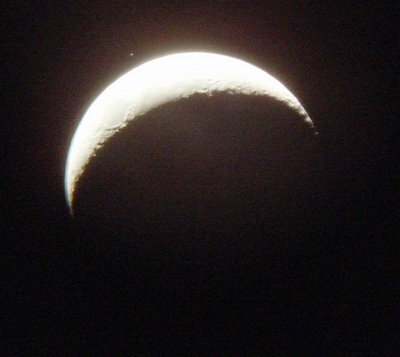 Very close to the moon, near the lower left of the lunar disk and much dimmer than Alcyone, is a star called Maia. This shot at 8:34 p.m. captures, going counterclockwise from the star closest to the Moon's limb, Merope, Electra, Taygeta and Maia. Alcyone was then behind the Moon. Finally, this shot at 8:56 captures Alcyone hanging above the Moon's bright limb like a rocket taking off from the lunar surface, just two minutes after the star reappeared on that side. Before tonight I had never seen a star at the instant that it "winked" out and got eclipsed, or watched one while it winked back into view. Tonight I did get to see one such event, through murky clouds almost dark enough to obscure it entirely: I saw Atlas, a multiple star and the second-brightest of the pack, wink out behind the Moon's dark limb at 8:39 p.m. It was a very frustrating night, with the clouds moving all evening over the Moon and leaving a wide open patch of sky in the south, where the Moon was not. Still, I saw a rare sight. 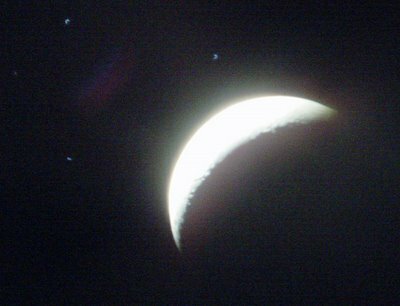 The photos above, taken at a magnification of 30, give a blurry representation of a few moments; but the best sight was in the binoculars at 7 p.m., when the Moon had not yet eclipsed the Dipper-shape of the entire Pleiades cluster but had approached so closely that it seemed the stars were wrapping around the lunar ball. [Post edited on April 6 to brighten photos]. Thanks for posting details on the event. What did you use for imaging through the telescope? What telescope do you use? BTW, four of headed down to a location where we could catch the grazing occultation of Celaeno. The clouds were a major problem. Luckily we all got to view the graze with binoculars and a small refractor. We viewed the event on Staten Island near the S.I. Ferry terminal. 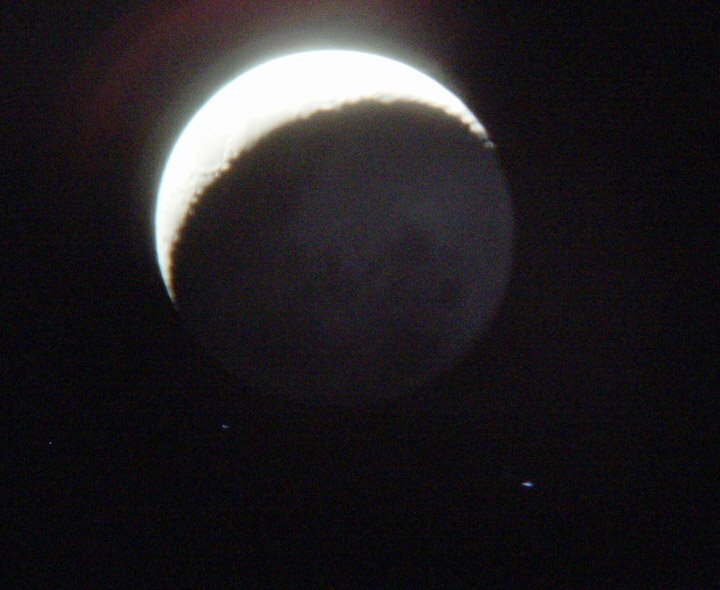 We saw 3 or 4 occultations of Celaeno passing behind mountains and we all thought it was an amazing thing to see. This is the first graze for me and hopefully not the last! That's amazing about Celaeno -- I've never seen a grazing occultation. I saw a star at 8:18 directly on the limb of the moon, and now that I look it up on Starry Night, it was indeed Celaeno. I wondered if it would become a grazer from where I was, and I guess it couldn't have, could it? The distance between my longitude and that of the Ferry Terminal is 7 miles, which is much more than the height of the lunar mountains (if that's the right way to think about this). In any case, clouds covered the whole sight just as Celaeno was getting extremely close to the edge of the disk. I never saw whether it disappeared or what. Since I'm east of the Ferry Terminal, I guess that Calaeno must have fully disappeared behind the lunar disk at some point. I just took the photos with an Olympus digital, auto mode, no flash, on an Orion 4.5" Dob reflector. No camera mount, no tracker. I hope at some point to get better equipment. Drop a comment with your observations any time; they're really interesting. We were approximately 0.75 miles south of the 'center line' for the graze. Anyone just north of this line experienced what you saw which was an extreme close approach. At 0.75 miles south of the limit we were in line for a triple disappeance which worked out perfectly. A half mile north of us would've experienced a single blink lasting a fraction of a second. Ah, north and south, that makes more sense than measuring my longitude. Celaeno was in fact to the north of the moon, but from our perspective, facing west that night, Celaeno looked like it was on the Moon's "side". My latitude is 4 miles north of the 'center line', still no good. If you do film such an event I'd love to see it.